Having a single USB-C port on my new MacBook was problematic, but no more, thanks to the 10-port OWC USB-C Dock. Cost aside, most of the ports that would be on a desktop Mac are here on the dock. And that’s the mission – PORTS RESTORED! 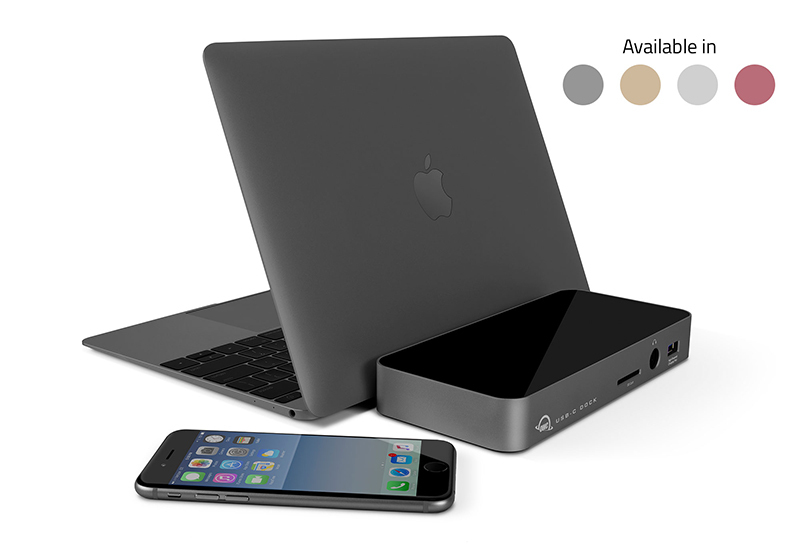 OWC (Other World Computing) markets this dock through MacSales and other outlets. 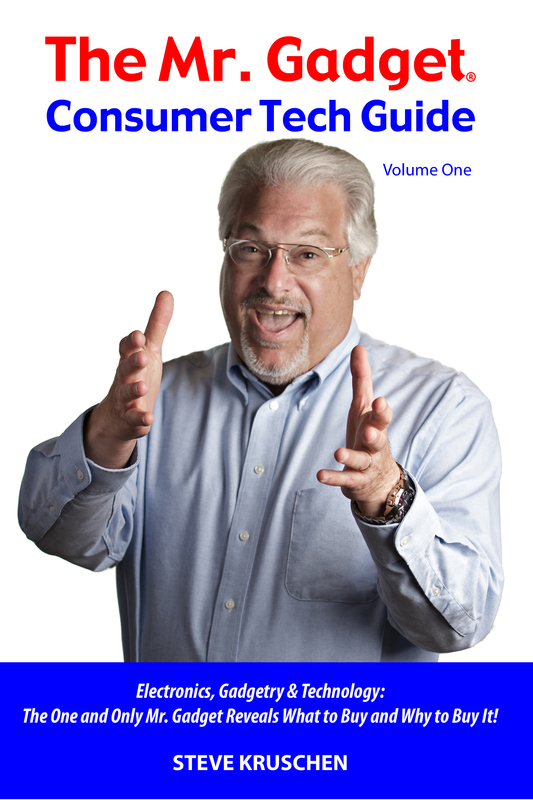 FYI, MacSales and OWC have been trusted, leading providers of Mac-related products for many, many years. A laptop relinquishes its complete portability when using the dock, as the tethered dock must be powered through its rather substantial power supply. This is the only operational gotcha, a small price to pay for restored and added functionality. 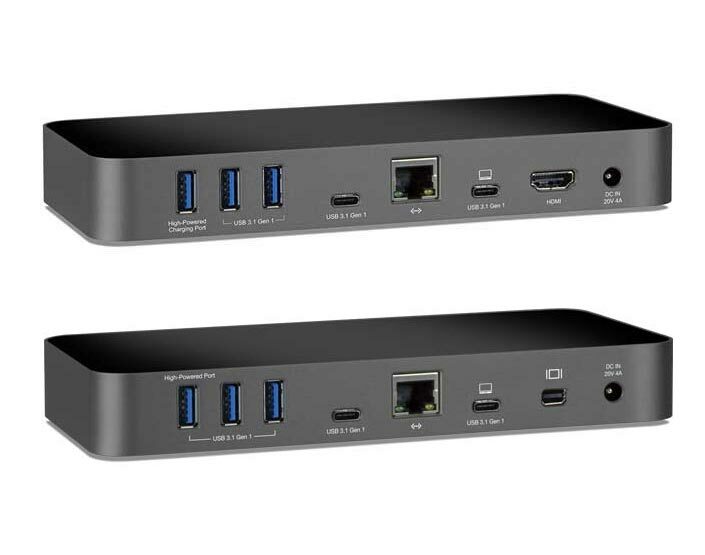 Five USB 3.1 Generation 1 ports are included, two of which are high power charging ports. 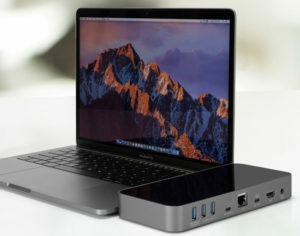 One is a USB-C port for current and future connections. A Gigabit Ethernet port allows wired networking up to the current highest speed. The sturdy aluminum adapter block also includes a combo audio port. This is useful for audio out through its 3.5mm jack or for a microphone. The SD Card reader recognized an inserted SD Card as expected and easily transferred data. The HDMI port allowing connection to an external monitor or TV also worked flawlessly with a computer monitor as well as with a 50-inch plasma TV. Using the HDMI capability to connect with a big-screen TV created a cumbersome combination of the computer tethered to the powered OWC device nearby to the TV. A $65 alternative is Apple’s (or other provider’s) USB-C Digital A/V Multiport Adapter, with USB-C pass-through power, HDMI, and USB that does not require an additional power supply. Note that there are also added cost models available with mini-display port instead of HDMI. Connected peripherals included a USB 3.0 hard drive for backup as well as little USB thumb drives and an external CD/DVD player/burner that requires two USB ports. These devices performed without a hitch both for burning and playing CDs and DVDs, as well as for transferring content from the discs and USB thumb drives to the MacBook. Once connected, an iPhone was automatically recognized for back-up and sync, plus charging. Really, what is not to like? I knew there was but the one port on the new MacBook. I also knew I needed to restore missing ports, and this OWC USB-C Dock has met and exceeded my needs as well as my expectations. Though transfer speeds were not measured, I did not feel as if data flowed slowly through the OWC block. If at all, one speed bottleneck could be the USB-C port itself on my MacBook. I know it is not as fast as on the 2017 iteration of MacBook. Though also not as fast as the ports built into a desktop Mac, there was no performance frustration while using the Dock. Performance and the convenience of having all the ports restored has outweighed ANY possible downside. This is a relief coupled with complete satisfaction. 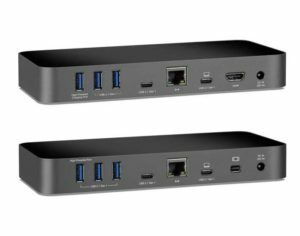 In conclusion, if you have a Mac (or PC) laptop and want your ports, do not hesitate to get an OWC USB-C Dock. Available from about $128 (depending upon the color) in Space Gray, Gold, Rose Gold and Silver (could not find a new one in silver at time of writing).